A Diamond Select Toys release! The biggest movie of 2015 is slowly becoming the biggest Minimates assortment of the years, as well! With so many characters and looks to choose from, DST is offering a second, completely different assortment of 2-inch Minimates mini-figures based on Avengers: Age of Ultron! With three different two-packs, plus a rare, one-per-case variant two-pack, this assortment will complete your Age of Ultron collection with a vengeance! The line-up includes: The Vision & Hydra Soldier, Phasing Vision & Hydra Soldier, Ulysses Klaue & Hulk, Hulkbuster Iron Man & Rampaging Hulk. 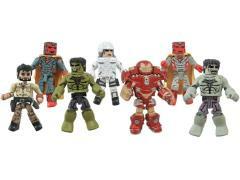 Each Minimate features 14 points of articulation, as well as interchangeable parts and accessories. Packaged in a full-color window box!